Happy New Year! I want to wish each one of you God’s richest blessings in 2015. May the new year bring you good health, peace, happiness, and prosperity. Beef olathiathu is my all-time favorite Kerala beef recipe. It’s my sister, Leela’s, signature dish and I’m sharing it as a gift to my readers for all the “likes” and comments you made on my Facebook page and here on my blog. I hope you will treasure this recipe as much as I do! Thanks to my sister, (my Ammama), for teaching me how to make this traditional Syrian Christian dish. In Kerala, in the old days, the meat would be cooked in an urali – a heavy metal vessel, which retains heat for a long time. Today, the urali is replaced with the modern pressure cooker. 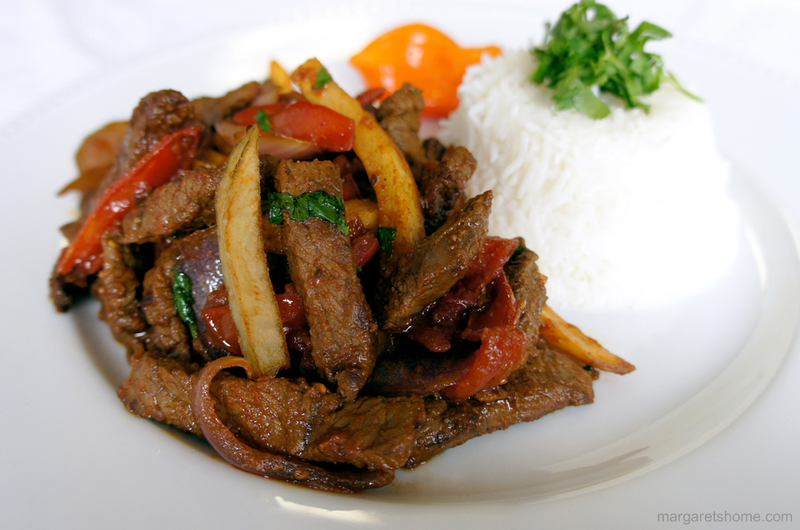 The beef is cooked and roasted in coconut oil, which complements the spices perfectly. If you prefer, you may use peanut or grape seed oil. But then, of course, you will lose some of the authentic flavor and aroma. Make this dish for New Year and enjoy the compliments! In a small non-stick pan, over medium-low heat, dry roast the chillies, coriander, pepper, cumin seeds, cinnamon, cardamom seeds, cloves, and fennel seeds until they smell fragrant. Cool completely and grind to a fine powder in a coffee grinder. Set aside. Mix the coconut pieces, turmeric powder, and salt in a small bowl. Heat two tablespoons of oil in a pressure cooker over medium heat. Add the coconut pieces and fry until light brown. Add the ground spices, half the shallots, ginger, garlic, vinegar, beef, and water. Close the cooker and bring to full cooking pressure, on high heat. Reduce to medium heat and cook for ten minutes or until the meat is tender. The amount of time will depend on the cut of beef and your pressure cooker. Allow the cooker to cool gradually. Open the lid and dry roast the beef until all the water evaporates. To season the meat, heat the remaining oil in a small non-stick pan, over medium heat. Add mustard seeds and when they splutter, add the curry leaves, and shallots. Fry until the shallots turn brown. Add the seasoning to the meat in the pressure cooker. Place the pressure cooker over medium heat, stir and roast until all the pieces are well coated with the spices. You can garnish this dish with sprigs of fried curry leaves, if you desire. Spicy meatballs in a tantalizing gravy, is the best way I can describe this kofta curry. The koftas (meatballs) are full of flavor and the lightly spiced coconut curry takes it to a completely different level. The koftas can be made with minced beef, lamb or chicken. You can make this dish well ahead of time as the koftas soak in the curry and just keep getting better. It is full of flavor and steals the show. So if you’re looking for a crowd-pleaser for your next party – this is it. Serve this kofta curry with rice, naan or puri. In a food processor finely chop green spring onion, chilli, cilantro, and garlic. In a large bowl add the ground beef, chilli flakes, and salt. Then add the finely chopped ingredients and mix until combined. Line a baking tray with parchment paper. Makes 35 small balls, the size of lemons, and keep them on the tray. Refrigerate until ready to use in the curry. In a small pan, over low heat, roast the above ingredients until they smell fragrant. Cool completely. Remove the outer cover of the cardamom and use only the seeds. Put all the ingredients into a coffee grinder and powder. In a large saucepan over medium heat, add coconut oil. Add the mustard seeds and when they splutter add the ground onion, garlic, and ginger. Fry until it turns light brown. Add the ground spices, turmeric, and Kashmiri chilli powder. Fry for two minutes and then add the tomatoes. Cook until they turn soft. Shake the cans of coconut milk well before you open them. Add coconut milk and salt and bring the curry to a simmer. If the coconut milk is thick, add half a cup of water. Gently add the meatballs, one by one. Let them cook for ten minutes. Then stir and let the meatballs simmer for another 10 minutes so they can cook completely. Turn off the heat and add lime juice. Garnish with cilantro and serve with rice, naan or puri.